- May rate rise a done deal, forward guidance key for Sterling. - Sterling back above key technical level of 1.15 against Euro. - Biggest moves over next 12 months to be Brexit-related. Pound Sterling has broken above the key 1.15 barrier against the Euro leaving the Pound-to-Euro rate at its strongest level for ten months. A combination of Euro weakness and fading fears over Brexit have facilitated the move higher, as has the question of interest rates at the Bank of England. Indeed, the Pound is forecast by analysts at global investment bank Rabobank to advance further on the Euro over coming weeks as the Bank of England elbows Brexit aside to become the predominant driver of Sterling exchange rates. And with interest rates likely to rise over coming months, this could be good for the Pound. The Bank of England and various policy-makers have recently warned of higher interest rates to come and markets now expect the Monetary Policy Committee to vote for another increase in the bank rate at its May meeting. Rising interest rates tend to support currencies as foreign capital flows are drawn to countries where returns are rising. “Brexit related news continues to rumble on but, in the approach to the May 10 BoE policy meeting, it could be the outlook for monetary policy that takes the upper hand in guiding the outlook for the Pound,” says Jane Foley, a currency strategist at Rabobank. The Bank of England said in February that it will raise interest rates faster and further than the market gives it credit for if the UK inflation picture evolves in line with forecasts published at the time. It predicted the consumer price index would remain above the 2% target until at least the first quarter of 2021 and that inflation would average around 2.9% for the first quarter of 2018. Since then markets have scrambled to bet on an interest rate rise next month, which will take the Bank Rate up to 0.75%, while consumer price inflation has fallen from 3% to 2.7%. The next inflation reading, for March, is due on Wednesday 18, April. Above: RaboResearch graphs showing speculators piling into the Pound. 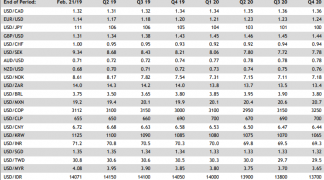 Pricing in overnight index swaps markets, which enable investors to protect themselves against changes in rates but also provide insight into expectations for monetary policy, implies a May 10 Bank Rate of 0.648%. This is up from the 0.56% implied rate that prevailed on February 07, the day before the BoE delivered its warning, and suggests a greater than 50% probability of an interest rate rise next month. “After the expected move from 0.5% to 0.75% this spring, the market is not fully priced for a hike to 1.00% until May 2019. 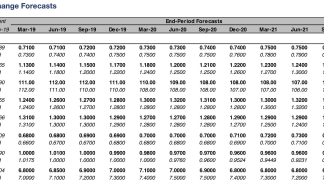 This suggests that for GBP, the most interesting part of next month’s policy meeting may not be the rate decision but the guidance referring to the risk of another rate rise later in the year,” says Foley. Indeed, markets will be acutely aware of the risk that the Pound falls following the next interest rate rise, in a typical 'buy the rumour and sell the fact' trade, as was the case following the increase in Bank Rate back in November. Therefore, it is the BoE's guidance on what comes next that matters most for Sterling. Any change in the implied probability of that subsequent interest rate rise to 1% can be expected to have an impact on the value of Pound Sterling relative to its major counterparts. Above: Pound-to-Euro rate shown at daily intervals. Since the BoE delivered its warning on February 08, which prompted the market to reprice its interest rate expectations, Pound Sterling has risen by 2.5% against the Dollar to trade at 1.4230 Thursday and by 2.1% against the Euro to trade at 1.1542. Hopes of even more interest rate rises further down the track could also prove a powerful stimulant for the Pound later in the 2018 year and beyond. According to Bank of America, the UK has scope to raise interest rates substantially more than other central banks without hurting its economy. Above: Bank of America Merril Lynch research graph. While the next couple of weeks appear to offer supportive conditions for Sterling, summer 2018 could see the Pound give back some of the ground it wins in April and May. “For now we expect that GBP will continue to draw some support from the anticipation that the BoE will maintain a hawkish position in the coming month, though ultimately we would expect the Pound’s biggest moves over the next 12 months to be related to Brexit,” says Foley. With March having seen British and European Union negotiators strike an agreement to preserve the status quo for 21 months after the UK leaves the EU in March 2019, markets have become more sanguine about the perceived risks of Britain’s departure from the bloc of late. However, Brexit and politics are seen as likely to become a greater threat to Sterling when October 2018 and its associated deadline for a deal on withdrawal and agreement on the future relationship approaches. This is because any final agreement will need to be approved by the European Council and then in all parliaments across the EU before it can come into effect. The presence of such a key deadline and contentious nature of the negotiations could well see talks go down to the wire, which may see markets begin to panic about the prospect of a disorderly Brexit later in the year. “As the summer months approach, we see scope for concern about the progress of Brexit trade talks to weigh on the Pound and see risk for EUR/GBP to edge towards 0.89 on a 3 month view. That said, it is our house view that the bones of a free trade deal will be in place by March 2019. We expect that this should spark a push back to 0.84 on a 12 month view,” Foley concludes. 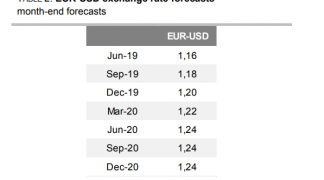 Foley and the Rabobank team forecast the Pound-to-Euro rate will fall to 1.1235, from its current 1.1550 level, over the next three months or so but that the exchange rate will then rise as high as 1.19 before next April comes along. Of course, the risk to that forecast is the Bank of England does indicate a more aggressive path of interest rate rises beyond May. This would leave three month target of 1.1235 looking too pessimistic. Get up to 5% more foreign exchange by using a specialist provider to get closer to the real market rate and avoid the gaping spreads charged by your bank when providing currency. Learn more here. The Euro slumped broadly on Thursday after IHS Markit PMI surveys suggested strongly that Germany's manufacturing sector missed out on the first-quarter recovery in the Chinese economy, as the former's industrial recession appears to have deepened in April. A bias now exists for continued pressure on the Pound which is likely to see GBP/EUR extend losses, says Mohammed Isah, an analyst at FXTechstrategy. Strong Chinese data has helped lend the Euro exchange rate complex a helping hand in mid-week trade, with the single-currency showing it tends to benefit on good news out of China. A foreign exchange analyst at a leading London currency brokerage tells us 2019's move higher in the Pound-to-Euro exchange rate is not necessarily over, despite the soft trade we have witnessed since the lengthy Brexit delay was announced.